The first gate of tarot is composed of the triptych - Le Bateleur (the magician), La Justice (justice) and Le Diable (the devil). We have already examined the magician as the coda of the major arcana, now we will look at it from the perspective of the first gate, that is in relation to the devil and to justice. The first gate sets the tone of the whole journey, it sets up, as it were, the leitmotif of the entire journey. This theme is a Faustian one. Faust is a central figure of western mythology. To Spengler and Goethe Faust is the defining archetype of western culture. In Faust the scientist/alchemist Faust sells his soul to the devil in order to know the secrets of nature, and to have the power that comes from this. In the triptych magician, justice, devil, we have the logic of the tale of Faust, reduced to its essentials. Faust is the magician, Mephistopheles is the devil, and the figure of justice is that feminine presence which is allied with the conscience of the scientist, and which is personified in the female figures of the tale. 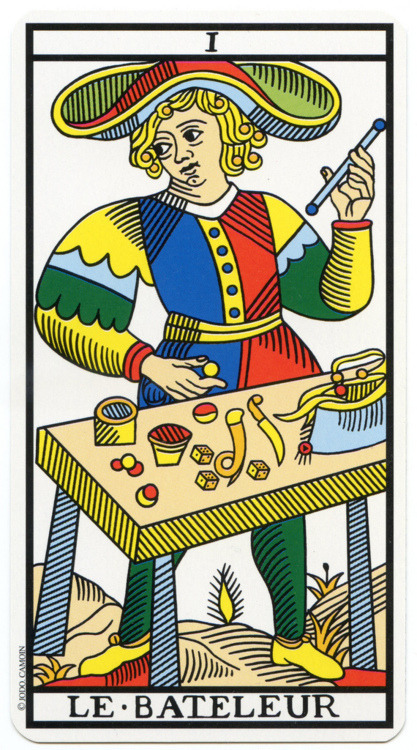 The magician as we have already seen, is traditionally associated with Will. Will is predicated on desire, the desire for something (or someone) and in the case of Faust and of western civilisation it is desire for the infinite: which becomes the desire for unlimited knowledge and power (and the most beautiful woman - Helen of Troy). For Spengler it is the lemniscate, symbol of infinity, that is the prime symbol of western culture. The lemniscate is a figure 8 on its side, and in tarot the '8' is seen as the number of perfection. If it is a yearning for the infinite that characterises western culture we can see it therefore as properly tragic. The infinite is by definition beyond the reach of the human,,,to pursue it is literally hubris. Hubris is a defiance towards the gods, and it invites nemesis - an avenging and correcting force of nature. The tragedy of western culture begins with a defiance of the gods and moves on to the quest to supplant the gods themselves...in our current age atheism (a total denial of the gods) is seen as an enlightened position,,,we are hardly mindful that what we are doing is preparing the way for the vengeance of nemesis. Faust is not an atheist. He knows what he is risking when he deals with devil - his soul. For us today this word does not mean much, though we have Jung to thank for the more acceptable 'psyche' which is really the same thing. We may not give much weight to soul anymore, but we are all very familiar with the fracturing of the psyche which is part of modern life. Schizophrenia and associated illnesses are illnesses of the soul. Vengeance is already being meted, but as yet we have not really grasped this, and it will be a while before the penny drops completely. It will take more work on the part of nemesis before we realise that we cannot transgress the divine law with impunity - this divine law is justice and justice is inexorable. Law for us has become divorced from divine law. Law is a wholly secular thing for the west and we do not take seriously the idea of a cosmic moral order (dharma), though perhaps we have retained hints of it in ideas like natural justice. Sometimes 'the Law' and Justice coincide; sometimes they do not. In any case Justice is beyond any legal formulation and enforcement, and She is implacable. But before we pursue our mysterious muse further we need to acquaint ourselves with the bad guy - the very baddest mother-flipper in western culture - the devil....the cause of all evil and sin, or was that just a bad rap? In Faust he is ambiguous....no doubt he tries and succeeds in tempting and tricking Faust, but he is also just giving him what he wants most and, unwittingly it seems, he seems to catalyse Faust's spiritual evolution. One thing is clear, a Manichean approach does not suffice and is just another symptom of a divorce which is at the heart of all our troubles - the divorce between mind and matter, god and devil, man and woman etc etc...and it is this sundering which is at the heart of this interpretation of the tarot, for it is only through the (re)unification of these sundered opposites that each gate is opened. The first thing I notice about this image is that the 'imps' have their hands behind their backs and they do not seem compelled to be where they are. In other words the Devil does not coerce, he tempts. The imps are where they are by choice. And who are these imps? Well they are humans but rudimentary ones. It is clear they have not entirely evolved from their animal origins. But what of the devil her/himself? And what does this androgyny signify? All angels are androgynous. And all angels (and yes the devil is Lucifer, an angel) have no free will - they can only do God's bidding. The Devil is an aspect of God. Whitman coined the phrase the 'square deific' - the trinity plus the devil. Jung described the Devil as God's shadow. Could it be that the devil, our adversary (the meaning of 'Satan') is but a means of challenging us to grow, to evolve? Just as in any sport or game, the best way to improve is to challenge a better player. And the devil is best there is, on earth anyway (perhaps Robert Johnson may be an exception). For that is another aspect of the devil - signified by the golden sphere on which he/she is perched. The Devil is the hidden ruler of the Earth (remember the devil is in the 'earth' square according to our interpretation). Another way of phrasing though is to say that the devil represents that portion of the divine that has been 'buried' in matter, in the earth. God does not intervene in worldly affairs - to do so would be to deny the primacy of free will. God must leave us to ourselves. But the devil is here amongst us, indeed all around us, indeed inside us - he is of the flesh. Another aspect of the devil wholly familiar to us, and part of the traditional interpretation of Le Diable, is his association with gold - with wealth - with lust not only for the body, but for money. This is why the devil is atop a golden sphere. Gold, symbolic of riches, is of the earth - is therefore of the devil. Gold is beautiful and does not tarnish readily. Because of this it retains its value, something essential for the idea of currency. The devil is the banker of the world - and he always demands tribute,,,in proportion to one's lust for this particular pleasure. Money, like the body, is of the earth, though today we have abstracted money to such a degree that this connection is no longer obvious. Money used to be worth what it weighed. It was a precious metal worth exactly its weight. Now money is digital but more necessary than ever. Because we don't have to carry it around anymore we can have, it seems, infinite riches. Remember it is the craving for the infinite that is the prime symbol if western culture. This is why we have billionaires, even though this means millions must struggle and suffer. The thirst for the infinite is absolute for the west and, in the context of wealth, unattainable. The lust for money is unending: once 'hooked', the afflicted soul becomes indifferent to all and everyone else - exactly like a heroin addict (another example of a yearning for the infinite).Drugs and drug addiction are therefore also an aspect of the devil, and also another example of this craving for the infinite. It has been said that alcoholics are in essence very religious souls. This is part of the logic of Alcoholics Anonymous which was created out of Jung's insights into the nature of addiction and the religious dimension as essential to a healthy psyche. Spirits and the spirit. Wine is divine - a symbol of god - the blood of Christ. Grapes are actually covered with the yeast that ferments them - ie wine is 'meant' to happen, it is a gift from God; but, like any medicinal, it becomes a poison with overuse. The devil is the darkness to the light of the magician. He has bat wings, where the magician has eight suns in his hair (yes, '8' again). The magician is intellect and feeling; the devil is materiality and desire and power. The whole logic of the tarot, and not just my interpretation, is to do justice to all these aspects. They are all essential to our health and evolution. And what of the flaming torch? A Promethean gesture. Just as Prometheus stole fire from the gods to bring to humanity, so the devil is the fire of god in matter. The devil is the angel of science and technology. Just as Adam and Eve were booted out for eating from the tree of knowledge (and who was it that tempted eve...? ), so Faust turns to Mephistopheles when he wants to know the secrets of nature, so that he might have control over them. Prometheus is a hero, but he was punished for his hubris. In any case he marks a shift in the heavens. From now on mankind becomes more equal to the gods, and this is again tied to that western desire for the infinite. Technology is a magical thing; but it is destroying the earth. Is this one way the devil can escape his prison? (an idea pursued in Donaldson's Covenant series), or is this the only way to impel a change in the direction humanity is taking,,,ie out of dire necessity....which is always the mother of invention. It seems that technology is beginning to mimic nature. The internet is a neural net, the same structure as our brains, and as the mycelial web that underpins plant life. Perhaps technology is coming full circle, revealing to us that the best technologies - the most efficient - are those nature has developed and perfected over millennia. A leaf is always the most perfect example of this - a 'solar panel' that builds, installs and operates itself. And trees themselves are an 'organic technology' that withdraws CO2 from the atmosphere. Our blindness to nature may yet be lifted by seeing once more that the technologies we need to solve our problems are those that are growing around us. Nature as ally, not resource. It is this point that is suggested by the green colour of the devil's torch - his fire (power, technology) is ultimately and wholly natural. Even uranium comes from the earth initially as yellowcake - there is no technology that is not derived from the earth, but there are many which are divorced from it. Justice is the central card of the first gate, and as such contains the secret by which we reconcile the magician and the devil. This allegorical image is still associated with the law today - most often she is blindfolded, here she looks us straight in the eye. The justice we are talking of here is not just the justice of the state or authority - it is also that which is revealed by looking squarely at ourselves. The sword represents the intellect, whose role is to separate truth from falsehood. The intellect has the power to overrule the passions when these passions have become compulsive. The scales are a symbol of balance. But what is being balanced? It is a mistake to give up one's sovereignty to the compulsive activity of greed and lust. If we become a slave to our passions then we risk losing what makes us human - free will; likewise if we do not honour the pleasures of the flesh and the pleasures of money and power then we are denying ourselves - a repression which creates neurosis. There is no formula here, no commandments. Justice is mute. She does not command, she responds. It is the faculty of conscience which she represents. If we see the magician, a la Faust, as a scientist, then justice is that complementary attribute of conscience - literally the inner knowledge to the outer knowledge of science. At the moment our practice of science does not take into account conscience very much. If it did we wouldn't vivisect animals and we wouldn't create poisons or nuclear weapons....science at the moment is without direction, and it can only be directed by conscience - by that inner faculty which tells us what is good and what is not. Science can tell us nothing of the good; it is focussed on function - it is amoral. But science and conscience together constitute a higher form of science, one we might call Goethean. Goethe practised a form of science that respected the phenomena themselves - he said 'do not look behind the phenomena... they are their own lesson'. In our quest to 'look beneath the surface' we have missed this point; and we have dishonoured the life of the earth through 'forcing her flesh'. The Goethean method allows the phenomena to 'speak for themselves', eliciting an intuitive response which is akin to an identification with what is being observed. This Goethean approach is implicit in the Steiner method of education, which is gaining popularity worldwide. It is also central to the 'design science' of Permaculture, which uses protracted observation and pattern analysis in order to integrate diverse components such that they work together, and therefore display the efficiency and resilience of natural systems. But we digress a little,,,Justice is first and foremost something we recognise by its absence in our human world. Inequality, war and the drudgery of work all seem to convince us that justice is the privilege of rich people only. Justice seems conspicuous by its absence. But we must look not from the political or legal level only - the tarot is primarily interested in the individual, in the soul and its development. Justice is a dimension of being, it is the ordering principle of the cosmos. The eastern concepts of dharma and karma are relevant here. Though it may seem justice is sorely lacking in the mundane world, there is always a 'balancing of accounts' going on....one cannot escape the consequences of any real crime,,,and this has nothing to do with any court or jail. One way of revealing the presence of a real and inexorable justice as the order of the universe is through transgressing it - this is the logic of Dostoevsky's 'crime and punishment', and of Sartre's 'roads to freedom' trilogy. Indeed this is the pivot point of Justice, and the key to the first gate: justice is not simple but compound: there is the explicit justice of the law - secular and religious; and there is justice as the implicit morality and perfect order of the cosmos which is revealed through our direct experience as the faculty of conscience. It is the conflict between the two that forces the issue, and this crisis can be very difficult and may take years to resolve: do we obey our parents, religion or state or do we obey our own will? And how do we know our own will is our own, and not conditioned, or compulsive (...tricks of the devil)? And how do we obey our own will without dishonouring the truth of our inherited values? The first gate represents a process of maturation that takes years and for many people is never fully resolved. The card of justice reveals this compound nature by the differences between the left and right of the card. On the left side the sword is not straight, the throne's background is divided in two (duality); on the right side, the royal purple and ermine representing (divine) wisdom, and the sphere atop the undivided pillar signifying spirit and perfection. One law is fallible, human and predicated upon shifting dualities of right and wrong/ innocence and guilt. The other law (more akin to lore perhaps) is perfect and is not about blame but balance. Here the concept of crime has meaning only as a crime against oneself, ie error or unconsciousness. From this perspective we can better understand how so many of our cultural heroes have been criminals, starting with Jesus and continuing through a roll call of martyrs and freedom fighters. Each of this individuals illustrated, through their courage and integrity, the existence and priority of a higher justice to that of the state or church. Their sacrifice reveals the sacred: that dimension from which flows the implicitly moral, organising energy of the world. If the 'world is order incarnate' as Miller says, then it is pointless to think we know better: to try and change things through politics or revolution...is this a declaration of resignation, or submission to authority? If it is it is not the authority of any state or system, but of the whole cosmos,,,it is a 'submission' to God's will, which is the meaning of 'Islam'; or in other words, to be in harmony with the Tao. Seen in this way we are agents of justice as well as products of it. Justice seeks to realise itself ever more fully through the agency of individual human beings as this is the only way Justice can effect itself. The ethic of the tarot is that to liberate oneself, to do oneself justice, is the only way we can aid the liberation of all. Jesus of Nazareth was a man from a small village far from the centres of power, a man with no money or worldly power, yet his radical freedom has changed the world more than any man of power or wealth. His example continues to catalyse the process of liberation in all who truly absorb it. No justice, no peace. Jesus brought the sword as well as the dove, and Justice too bears this weapon. The sword here is the weapon of the mind. The pen is not only mightier than the sword, in the case of tarot, it is the sword. We can only free ourselves from the inertia of the mass by developing our intelligence and capacity for understanding and expression in the face of it. If it is the truth that sets us free then it is the truth as verified by our own selves and no other. By doing this we cut ourselves off from the comfortable illusions we have been reared on and set sail on uncharted waters. This aloneness is symbolised by the guardian of the next gate - the hermit. Before we continue, permit me another aside, if only for my own benefit. The cards of heaven, the top most row indicate an aspect of the heavenly realm, and the cards directly below in the bottom row, the earthly realm, indicate earthly aspects, which are the mirror of the heaven cards above. Each gate is the confrontation of a spiritual archetype with its material alter ego. The principle is thus: each material or earthly archetype originates from a spiritual source, from the spiritual archetype directly above...this psychic energy is then given a new incarnation, in matter. This new incarnation reflects its spiritual origins but expresses them in a new idiom – which is that of the soil and flesh, wholly corporeal, sensuous, sensual.. the original spiritual archetypes, indicating conscious agency, are counterposed with the another agency, an unconscious agency implicit in life itself. The circuit is double: the spiritual archetype seeds itself in the generative matrix of the earth; the forms of life produced by this matrix together constitute a perpetual striving towards the spiritual dimension from whence they came. In other words the same principle but two different directions. Thus the central row acts as mediator, ensuring both directions can be expressed simultaneously. For instance the magician represents the will of the ego; the devil is the will of the flesh; the two principles are of the same type and therefore it is right that the scales of justice are the mediating symbol. What will be weighed (compared) must be like to each other. And what is weighed are these contending wills, wills that are weighed against the other in the interests of balance. The central card mediates here by saying the justice of the universe inheres in a balance between the desire of the spirit to invade the world and a desire of the flesh to storm heaven. Either one by itself is hubris, an overstepping of man's right authority, which invites nemesis – a symbolic and shattering balancing of accounts. The desire of the flesh to storm heaven is to say mans appetites unbounded. We can see today it is this libertinage which weighs heaviest on the scales – the world of the spirit weighs but little in comparison, thus the imbalance must be corrected, for justice is perfect. But justice can only be effected through the individual, never en masse. And the process through which justice is effected through the individual is the process of the remaining six gates. The first gate is activated through recognition of injustice in a visceral sense (this is why justice has a rope around her neck). This activates the conscience – the evaluative complement the the intellect, which now enables the intellect to work effectively – which is when the mind (sword) is directed (points) to heaven, to things of the spirit. The ugly truth is seen clearly and the perfect justice which is implicit in having a sense of injustice, in having a conscience, this perfect justice has impelled the individual towards his goal, which is nothing other than his soul. We have travelled through the first gate.